Two servicemen who managed to get back were not among the previously reported fatalities. A serviceman of the 16th detached motorized infantry battalion of the Armed Forces of Ukraine was taken captive by pro-Russian militants during an engagement near Krymske, Luhansk Region on 23 November, the battalion has said on Facebook. "Due to distorted reports about the servicemen killed in the 23 November engagement near Krymske, Luhansk Region, we would like to offer an explanation. It was officially reported that four Ukrainian servicemen were killed in this area. In particular, it was confirmed that one serviceman of the 16th detached motorized infantry battalion was killed in an unequal battle, his body was delivered to the Ukrainian side. This is Junior Sergeant Denys Kryvenko. The information about the other three servicemen of the battalion will be made public only after their bodies are transferred and their identities are confirmed. It was later reported that two our servicemen returned. The two Ukrainian servicemen who managed to escape from the battlefield were not among the four previously announced fatalities. Unfortunately, one serviceman of the battalion failed to return from the battlefield. He was taken captive by Russian mercenaries," the battalion said. The 16th detached motorized infantry battalion is part of the 58th motorized infantry brigade. Presidential adviser Yuriy Biryukov said on Facebook that servicemen of the 58th brigade launched an unauthorized attack near Krymske. "I have no words but curses about this story," he said. According to Biryukov, the acting commander of one of the companies of the brigade, "having seen too many reports about the capture of two villages of in the grey zone at the Svitlodarsk salient", wanted fame for himself. "And forward they went. The mastermind was the first to be killed. And he also lost his people. No-one understood why they did this," Biryukov said. The serviceman who was taken captive is expected to be exchanged, he added. On 23 November, five Ukrainian servicemen were killed and four wounded in combat in Donbas. The hottest spot was the village of Krymske where an engagement lasted for eight hours. Four servicemen were killed there and two wounded. 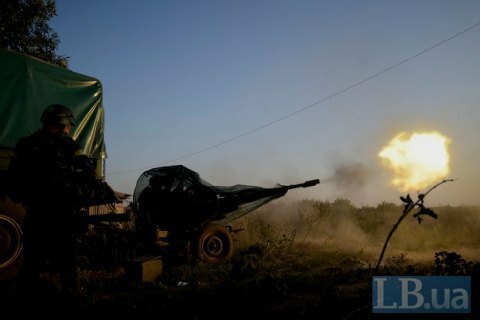 Some separatist sources said that the Ukrainian servicemen attempted to cross the Bakhmutka motorway towards militants' positions but came under fire from machine guns.